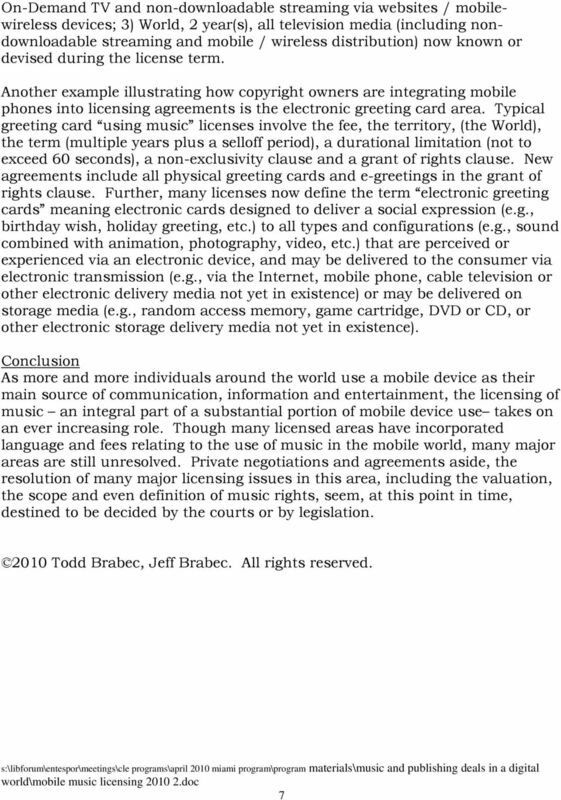 Download "Mobile Music Licensing: A New Model, A Variation On The Old Or Just Something New And Different By: Todd Brabec Jeff Brabec"
LICENSING MUSIC ON THE INTERNET Cydney A. 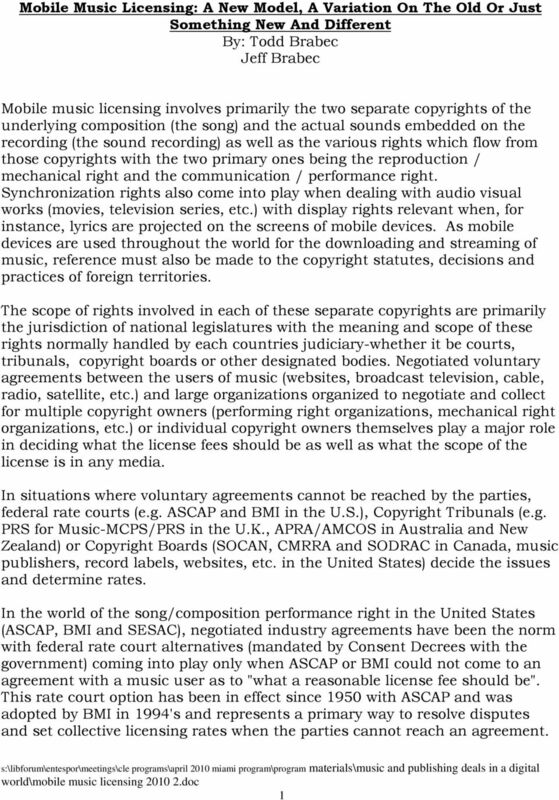 Tune Pillsbury Winthrop LLP This article is the fourth and final in a multi-part series on music licensing. There are many ways that music is used on the Internet. What s covered and what s not Christian Copyright Solutions (877) 947-9687 www.copyrightsolver.com CCLI (Christian Copyright License International) Reproduction license for songs in the CCLI Song program. 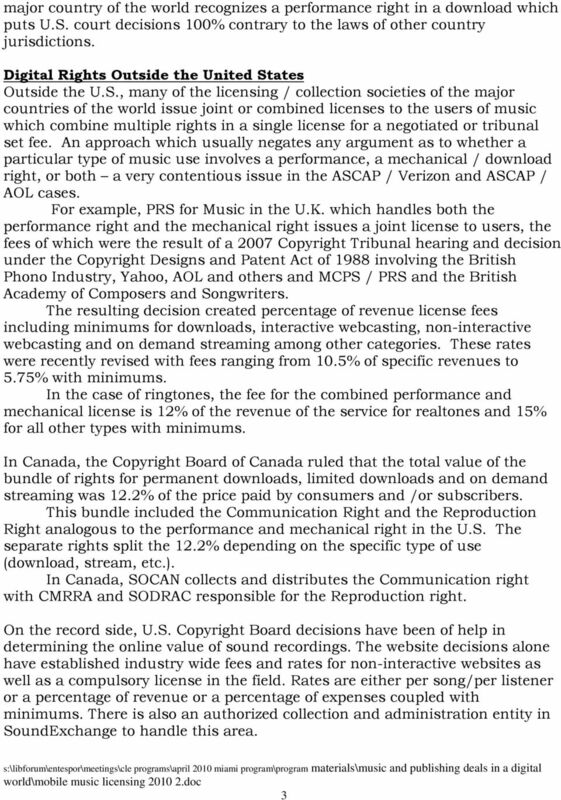 This license allows commercial use of music from DanoSongs.com without having to provide credit. REMIX AGREEMENT. The label commissions the producer to remix the title: at a length of. minutes. There is public domain music. Some music which has been written by someone who has been dead for at least 50 years, anyone can use for free. PROCEDURE. Materials that will be offered for sale or licence and that are intended to generate sales revenues or royalties. Public Consultation on the Review of the EU Satellite and Cable Directive I. General Information on respondents I m responding as: What is your nationality? What is your name? What is your e-mail address? EMMS MUSIC SUBMISSION PACKAGE Thank you for considering submission of your music to IBM. Here are the steps you need to follow: 1. 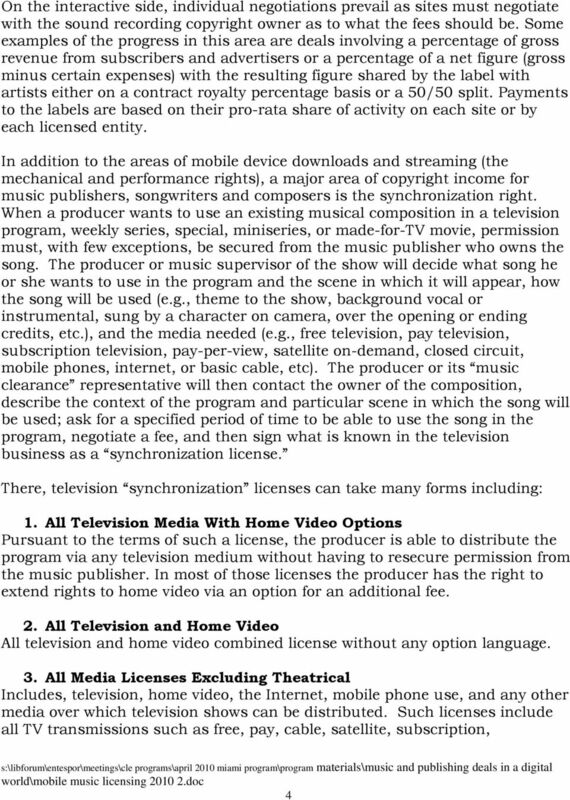 Complete and sign the "RIGHT TO USE MUSIC" agreement on pages 2-5. 2. Before the OFFICE OF STRATEGIC INITIATIVES COPYRIGHT OFFICE LIBRARY OF CONGRESS Washington, D.C. 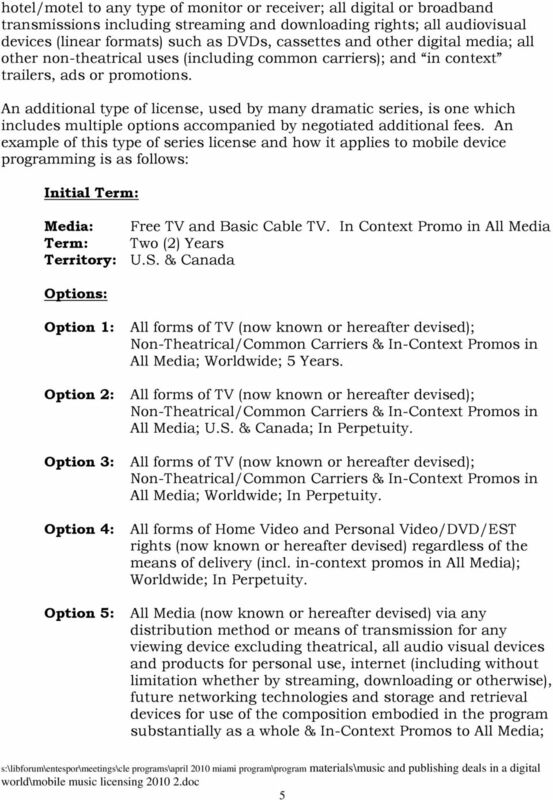 THE FCC S RESPONSE TO AMERICAN BROADCASTING COMPANIES, INC. V. AEREO, INC. SAMPLE LETTER OF AGREEMENT Opening paragraph: defines the parties to the agreement and the purpose of the project. End with: This agreement supersedes any previously dated agreement between these parties. The full list of grant programs and eligibility are located here. I. 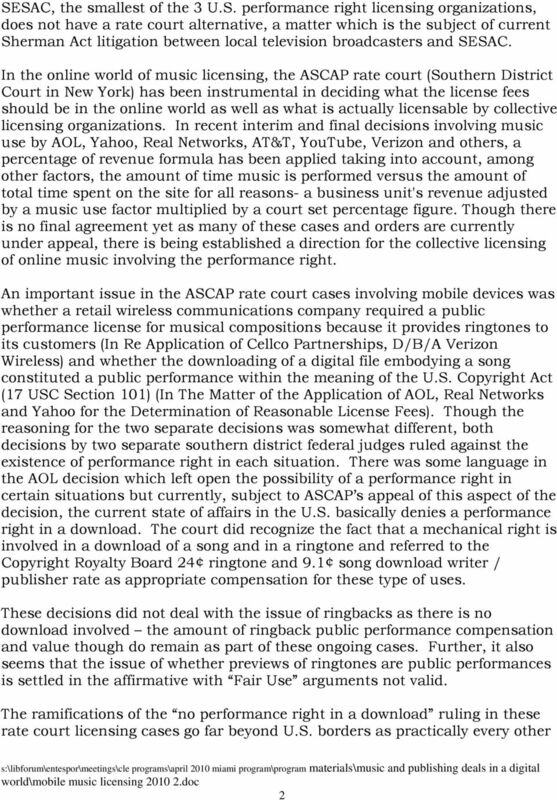 Introduction ANALYSIS OF PROPOSED CONSENT ORDER TO AID PUBLIC COMMENT The Federal Trade Commission ( Commission ) has accepted for public comment from America Online, Inc. ( AOL ) and Time Warner Inc.
AUSTRALIAN DECLARATION UNDER PARAGRAPH 2 OF ARTICLE 36 OF THE STATUTE OF THE INTERNATIONAL COURT OF JUSTICE 1945, LODGED AT NEW YORK ON 22 MARCH 2002. TELEVISION / CINEMA COMMERCIALS. Per product, per hour, per medium, per track. Fees include use for Pay TV as well as free-to-air. Cinema is separate.